La Jolla is one of San Diego's luxury real estate markets known worldwide for natural beauty and a resort atmosphere with stacked hillside homes overlooking the ocean. Included below are homes for sale in La Jolla. If you would like more information on any of these La Jolla real estate listings, just click the "Request More Information" button when viewing the details of that property. We can provide you with disclosures, past sales history, dates and prices of homes recently sold nearby, and more. And, if you haven't already, be sure to register for a free account so that you can receive email alerts whenever new La Jolla houses come on the market. The seaside community of La Jolla is nestled along a curve of the Southern California coastline. With 7 miles of white sandy beaches, residents of La Jolla are in a perfect position to enjoy all the perks of oceanfront living. La Jolla’s coastline includes a mixture of rocky shores and sandy beaches. The rocky shores are popular with photographers – the steady stream of waves crashing into the natural rock formations is the perfect backdrop for a photo. La Jolla has a population of just over 40,000 residents. This mid sized community is home to a diverse population that includes residents of all ages and all walks of life. 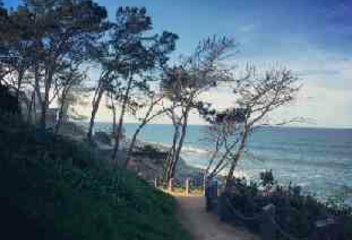 La Jolla is situated between Pacific Beach and Del Mar, two other coastal communities known for their upscale living and luxurious homes and condos. La Jolla’s towering hills and cliffs are covered with winding roads lined with upscale homes. These ocean view hills offer La Jolla’s wealthier residents the opportunity to look out over the Pacific Ocean from their own front porch. Torrey Pines Golf Course is best known for the Farmers Insurance Open. This PGA Tour event was formerly known as the Buick Invitational and it has attracted top players to the area for years. The golf course is owned and operated by the city of San Diego. This public course boasts 36 challenging holes, some of which overlook the nearby Pacific Ocean and its rocky beaches. This golf course is as beautiful as it is challenging, making it a must play course for any golf enthusiast in the area. As a whole, the residents of La Jolla are very involved in their community. Various aspects of day-to-day life are overseen by the La Jolla Community Planning Association —a group that is responsible for the management of several other government agencies like the city council, the City Planning Department, and the Planning Commission. Another prominent government group is the La Jolla Town Council, a nonprofit organization that is made up of residents and business owners who want their voices to be heard. La Jolla also includes neighborhood centered groups such as the Bird Rock Community Council and the La Jolla Shores Association as well as service clubs like the Social Service League of La Jolla and La Jolla Woman’s Club. If you are interested in living in an upscale neighborhood filled with opportunities to get involved in your community, the seaside gem of La Jolla might be the right choice for you. The median list price for homes in La Jolla, CA is just over $2.1 million. When the properties in La Jolla were compared to similar homes in other parts of the United States, this price point was found to make La Jolla one of the most expensive, if not the most expensive, neighborhoods in the country. The properties here have a median list price of over $800 per square foot, a figure that is about $400 higher than the San Diego average. The real estate in La Jolla is surprisingly diverse, with the most expensive properties in La Jolla selling for more than 10 times the price of some of the other, smaller homes. In addition to the large, upscale estate style homes in La Jolla, the city also has several fantastic communities of luxury condos. These communities of condos and townhomes include neighborhoods that are made up of newly constructed properties as well as older, pre existing communities of condos and townhomes. One such community is in the Bird Rock district, a unique little area that includes a blend of shops, restaurants, and businesses. This neighborhood hosts frequent community events such as Halloween Window Painting, a 4th of July parade, and a Susan G. Komen Cancer Walk. Other popular neighborhoods include La Jolla Shores, the Village of La Jolla, La Jolla Village, the Upper Hermosa, and more. For more information on the homes and condos for sale in these great neighborhoods, call or email our team. We will be happy to answer any questions you might have about La Jolla, Del Mar, or any of the other nearby communities. Our team at Aumann Bender & Associates is just a phone call away. Colony Hill consisting of forty one homes located in the Mount Soledad area of La Jolla overlooking La Jolla Shores. Floorplans consist of three, four, and five bedrooms with 1907-3488 estimated square feet. Colony Hill community amenities include a pool. Harbor Heights is east of Kate Sessions Park in La Jolla 92037 CA. Streets within Harbor Heights include Edgeworth Road, Belloc Court, Harbor Heights Road, Balfour Court, Crownhill Road, Blackmore Court, and the southern most portion of Soledad Mountain Road. Soledad Corona Estates are located off of Soledad Road on a canyon rim with picturesque views of the ocean.